Have you ever suffered from a loss of feeling in part of your hand after an extended bike ride? Not only is it uncomfortable, but the use of your fingers decreases the longer you continue, which can make shifting and braking difficult. You may be suffering from a condition known as ulnar neuropathy (also referred to as ulnar palsy, handlebar or cyclist’s palsy). Experience and style need not apply – this condition can happen to cyclists of all skill levels, and in all genres of cycling. I purchased my current road bike (Cervelo R3) in 2014. The geometry and frame stiffness were different than my previous bike (Trek Madone) so it took a bit to get used to, especially on the multi-hour hauls. For the first month, I had some difficulties with my fit/set-up and ended up seeing a few different professionals before my problems were relieved (the slew of research helped a lot, too). One of the primary problems was manifesting in my hands. I knew I was putting a slightly uncomfortable amount of pressure on my wrists and palms due to a not-so-perfect upper body fit. When I’d finish pedaling, my fourth and fifth fingers would be tingly and numb, my palm would ache, and I couldn’t very well grip my ice cold, post-ride beer (or smoothie, or whatever your preference). I had a similar palsy experience once before, although in a much more severe fashion. In 2011, I ended up fracturing my ulna after taking an unfortunate tumble while mountain biking (right into poison oak, too!) I landed with my arm and wrist extended, where a rock smashed into the very spot where the ulnar nerve exits the wrist and enters the palm. I lost all feeling in my fourth and fifth fingers and suffered digit paralysis for about 2 weeks. It took nearly a month to fully heal. What is a neuropathy or palsy? Neuropathy: (neur or neuro – of the nerve; pathy – feeling or disease). A medical condition that results from motor, sensory and autonomic nerve damage. Palsy refers to paralysis of an area that a nerve innervates, such as the face, limbs, or hands. The condition may be acute or chronic (short or long-term/recurring), and may affect one or several nerves. Causes include impact-related injury (blunt-force trauma), short-term compression or entrapment of the nerve or nerves, recurring pressure or movement-related stress, and various diseases and cancers. Symptoms include loss of feeling, decreases in muscular function and reflexes, chronic deformities and muscle atrophy, and paralysis. The ulnar nerve extends down the medial forearm, through the wrist where it travels between the pisiform and hamate bones, separates (bifurcates) into sensory and motor neurons, and innervates, or supplies, the fourth and fifth fingers as well as other parts of the hand. 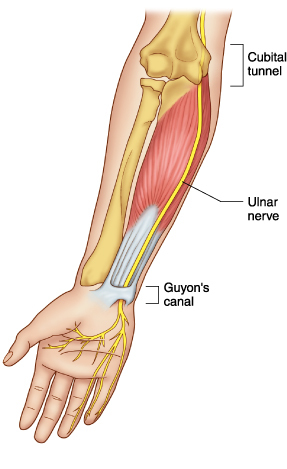 The primary area that is affected is called Guyon’s canal, where the ulnar nerve travels through the wrist. When upper body fit to the bicycle is not ideal, the ulnar nerve becomes compressed as extra pressure is placed on the medial-proximal palm (the meaty part). 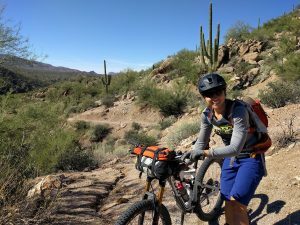 Overextension of the wrist (if the handlebars are rotated too far upward) is another cause of ulnar nerve entrapment, as well as increased pressure when riding downhill due to a more forward center of gravity. Consistent vibration and shock from the road/terrain only exacerbate the issue. After a period of time (sometimes it takes just one, extended bike ride), muscular and/or sensory issues may arise. Neuropathy classification (Type I through Type IV) depends on the area of the nerve affected – before or after Guyon’s canal, and each has slightly different symptomatic outcomes. Types of Ulnar Palsy. Slane, et al., 2011, Clinical Biomechanics. 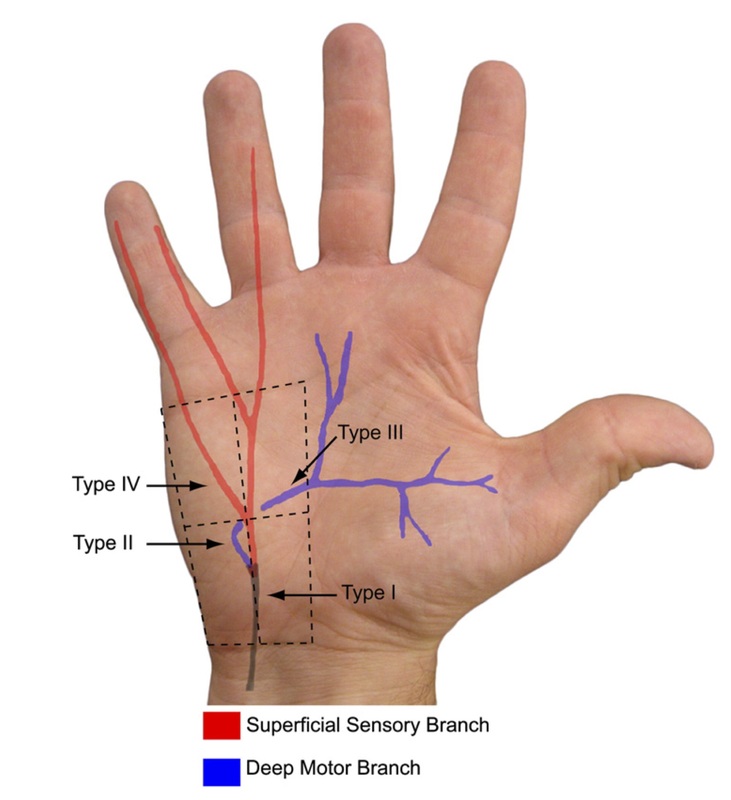 Some analyses have shown the development of a lesion on the terminal motor branch of the nerve (the part that supplies the muscles of the fourth and fifth fingers), which is responsible for motor dysfunction. Depending on the severity and length of the compression, an individual will experience the onset of tingling, followed by an eventual loss of feeling and motor control in the hand. Uncontrollable finger curling may occur as well as the neuropathy continues to progress, which is most noticeable when the hand is removed from the handlebars. Rotate the handlebars forward to shift pressure off of the ulnar nerve. This will relieve potential overextension of the wrist, which could be a cause of ulnar nerve over-stretching and compression. Try wearing gloves, or different ones if you already do. A study published in the journal Clinical Biomechanics analyzed the different affects of glove type and handlebar position on the area of the palm where ulnar nerve compression is a problem. The researchers found that thin foam-padded gloves significantly reduced pressure loads on the palm the most (between 10-28 percent), enough to prevent problems during long bouts of cycling. Frequently change hand positions to spread the concentration of pressure from one area to among multiple locations. Don’t land on your hand when you crash! Even better, avoid crashing altogether. Capitani, D., & Beer, S. (2002). 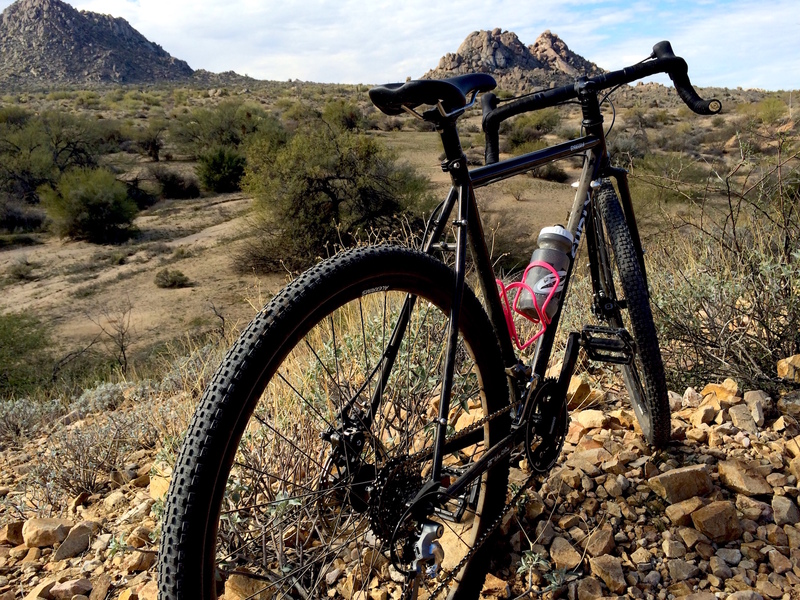 Handlebar palsy–a compression syndrome of the deep terminal (motor) branch of the ulnar nerve in biking. Journal of neurology, 249(10), 1441-1445. Huether, S. E., & McCance, K. L. (2013). Understanding pathophysiology. Elsevier Health Sciences. Patterson, J. M. M., Jaggars, M. M., & Boyer, M. I. (2003). Ulnar and median nerve palsy in long-distance cyclists a prospective study. The American journal of sports medicine, 31(4), 585-589. Slane, J., Timmerman, M., Ploeg, H. L., & Thelen, D. G. (2011). The influence of glove and hand position on pressure over the ulnar nerve during cycling. Clinical biomechanics, 26(6), 642-648.
cycling, palsy, ulnar neuropathy. Bookmark.